Essaouira: explore the narrow streets of the city’s medina as you immerse yourself in this destination’s laid-back Moroccan flair. Essaouira is a lesser-known Moroccan gem, formerly known as Mogador. Essaouira has a population of about 78,000 residents and is not as busy as the bustling Marrakesh or tourist-filled Casablanca, allowing visitors to fully immerse themselves into an authentic Moroccan feel and experience. Top tourist attractions include the Essaoiura Medina, its characteristic fishing port and the Essaouira Ramparts. Set your sights on this slow-paced life with cheap flights to Essaouira which are available for a limited period of time! Essaouira is home to Essaouira-Mogador Airport (ESU), located on a scenic 20-minute taxi or car drive from the city centre. Essaouira-Mogador Airport serves a number of airlines, including Royal Air Maroc, EgyptAir, South African Airways and Virgin Atlantic. There are no direct flights from South Africa but popular connecting flights depart from Johannesburg and Cape Town. Wander the charismatic streets and winding alleys in the medina of Essaouira, stopping to browse art galleries and sample Moroccan treats that are unique to this part of the country. 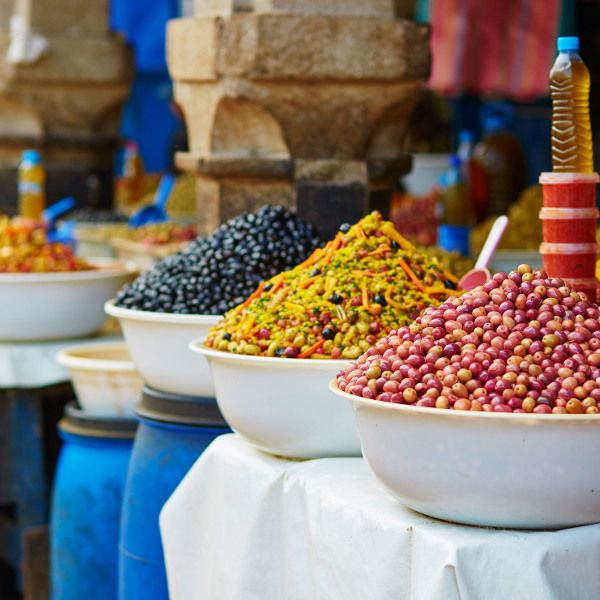 Though the food across Morocco is known to be distinctive in cuisine, in Essaouira you’ll find food markets with the sweetest and freshest array of produce, perfect on its own or with some mint tea. Between the months of April and November, the coastal city is alive with kite, wind and great wave surfers taking full advantage of the tides found on the Atlantic coast. Make sure to pack your wetsuit! This laid-back Moroccan city is wonderful to visit all year long as it does not experience any extreme weather changes. The summer months can find more tourists than usual enjoying the famous Gnaoua Festival and other exciting activities. The best time to visit Essaouira is in spring, during the months of May and June, before the city gets very full. 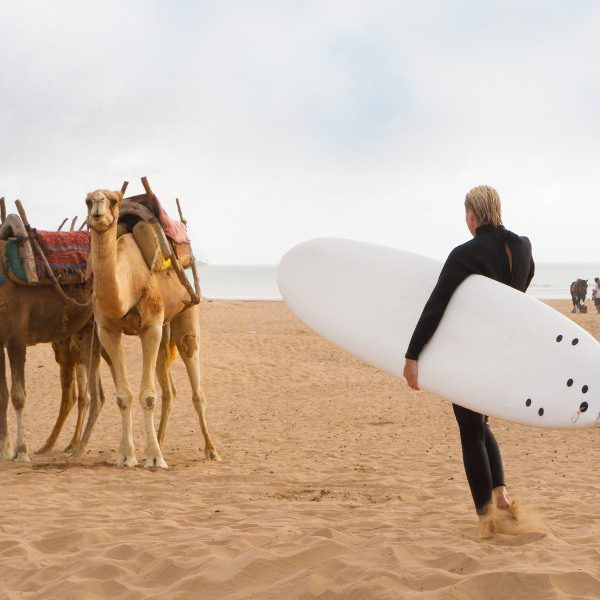 Winter is also an ideal time to visit if you’re after a cooler Moroccan experience with day time highs of 17°C. Situated on the Atlantic coast of Morocco is the magical city of Essaouira, the home of a walled medina set against a backdrop of blue and white painted homes. Essaouira is also known to have some of the nicest vendors in the country, offering you smiles, a good deal and possibly even a cup of mint tea as you negotiate your way through beautiful scarves, home-made ornaments and other trinkets. The coastal town is known to have a charismatic wind, known locally as Alizes, that keeps the beaches mostly deserted and perfect for some soul-searching or even a romantic stroll. The city has a distinct Arab flavour to it and you will feel as though you have stepped back in time as you enjoy the slower pace of life, with locals often only setting out for the day at 10am. Visitors can also take advantage of the perfect ocean conditions and enjoy thrilling sea activities such as wind and kits surfing, as well as body boarding and surfing too. Compare several airlines, and book your cheap flights to Essaouira online with Travelstart! South Africans who wish to visit Essaouira in Morocco will need a visa to do so. You will need to complete an application form, and have the following: a passport that’s valid for a minimum of six months from the day of entry into the country, flight tickets, two passport photographs, proof of accommodation, a letter of invitation and a copy of the invitees’ passport or ID. 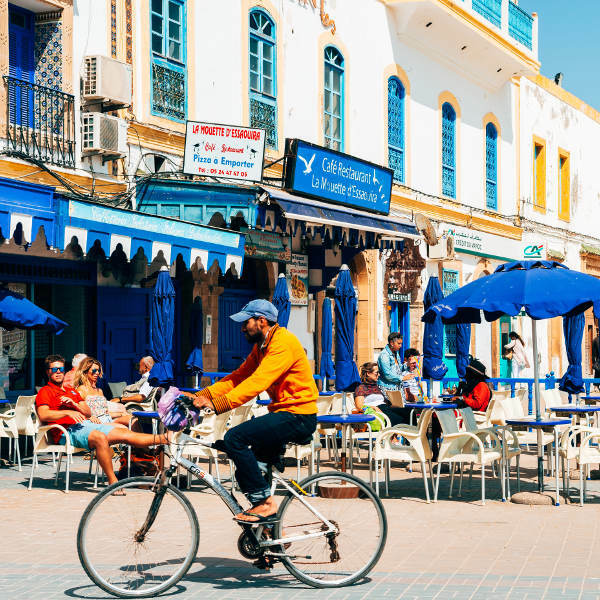 Essaouira is not yet as popular as other Moroccan cities and so as a result, you will find less petty theft and a safer environment than in the larger cities. The people are friendly and warm-hearted but do be cautious of some locals offering budget accommodation or to carry your luggage for you. During summer, the city can get quite full and so the usual travellers precautions apply, such as not flashing your expensive possessions.